When ChannelLock said they wanted to send me their new Model #412 6.5” V-Jaw Tongue and Groove Pliers, I was a bit hesitant. My job is in installing commercial cabinets and millwork, how effectively could I test a tool that is designed for nuts, bolts, etc. After a bit of use, my concerns were quickly put to rest. First let me explain the difference between ChannelsLock's regular tongue and groove pliers and their V-Jaw sibling. 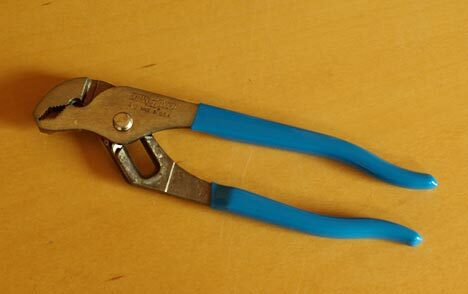 While the regular T&G plier has two parallel flat contact surfaces with teeth at a right angle, the V-Jaw version has a V shaped contact surface with right angle teeth on each separate surface. This means that you have a total of four contact points over the two you would find on the regular model. Because of the V-Jaw you not only have better gripping on hex shaped objects, but you also have a huge advantage on round things like pipes and tubing. During a recent job I decided to put the 412 V-Jaw in my pocket and see what they could do for me throughout the day. At first I put them to use pulling out some small brad nails and they did a great job. They worked better then I expected, so much so, that they have pretty much replaced my ChannelLock End Cutters as my nail puller of choice. I don't think ChannelLock would mind me replacing one of their tools with another. Because they are small enough to fit in my pocket and are light in weight, I ended up keeping them in my pocket for the length of the entire job, which was two weeks, and found all kinds of uses for them. They came in handy when I needed to install some brackets for a plexiglass panel wall, and were a life saver when I had to remove some stripped screws. I was even able to use them on a bolt or two. They turned out to be quite useful and I found myself reaching for them more then I thought I would. My co-workers also loved them, and kept bugging me to use them when they ran into a problem. All in all the 412 6.5” V-Jaw Plier is a great tool, and will be my plier of choice in the future. At only around $13 for a quality tool that is made in the USA, it would be hard to pass these up.